@AGGuelph Has a Great Event Coming Up #Guelph! Join us for a talk and tour led by Guelph artist Greg Denton of his solo exhibition Hours, featuring new work that highlights elements of time, process, and performance in portrait painting. Denton engages paint as a time-based medium, incorporating conceptual and autobiographical dimensions shared with photography and video in the creation of his over-life-sized portraits, each painted with a tonally rich palette and expressive detail. The exhibition includes Denton’s 100 Portraits/100 Poppies series, created in 2015 during his tenure as the City of Guelph’s artist-in-residence, throughout which he performed his craft live and in public venues, painting individuals from Guelph’s military communities. 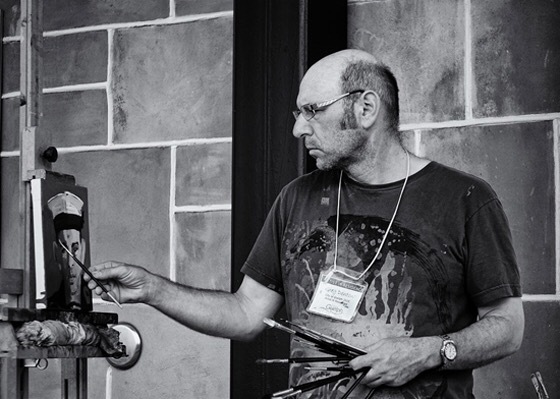 Greg Denton is a portrait painter, professor, singer-songwriter, banjo player, urban cowboy, campfire lover, raconteur, and a quintessential figure in downtown Guelph. Denton’s anyone lived series, created in 2000, is composed of 400 individual portraits of members of the Guelph community. The entire series is displayed in the public meeting rooms at City Hall and at The Guelph Community Foundation in downtown Guelph. Greg Denton: Hours is curated by Dawn Owen and remains on view at AGG until December 18, 2016.